1 Decision Analysis. 2 I begin here with an example. In the table below you see that a firm has three alternatives that it can choose from, but it does. 2 2 I begin here with an example. In the table below you see that a firm has three alternatives that it can choose from, but it does not know what future conditions will be. 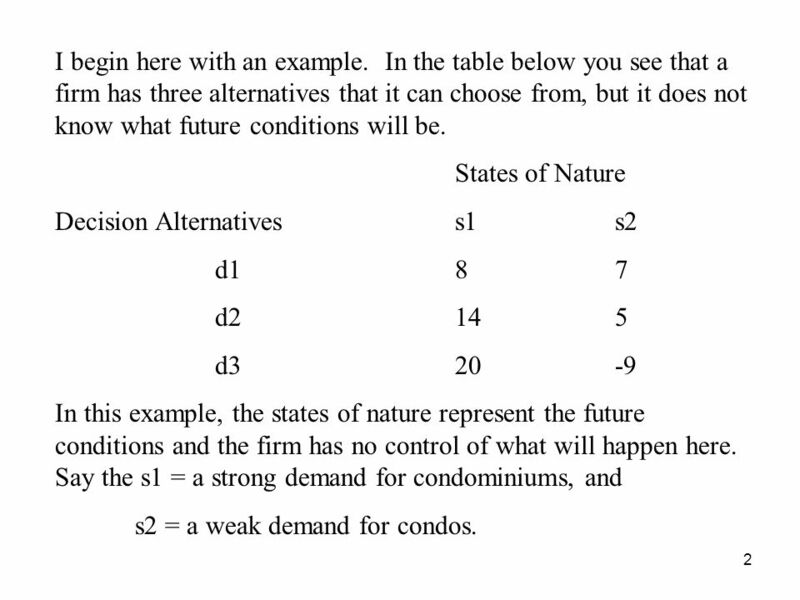 States of Nature Decision Alternatives s1s2 d187 d2145 d320-9 In this example, the states of nature represent the future conditions and the firm has no control of what will happen here. Say the s1 = a strong demand for condominiums, and s2 = a weak demand for condos. 3 3 Now, in the example the firm has a tract of land and it has to decide how many condominiums it should build on the land. Say d1 = 30 units, d2 = 60 units and d3 = 90 units. 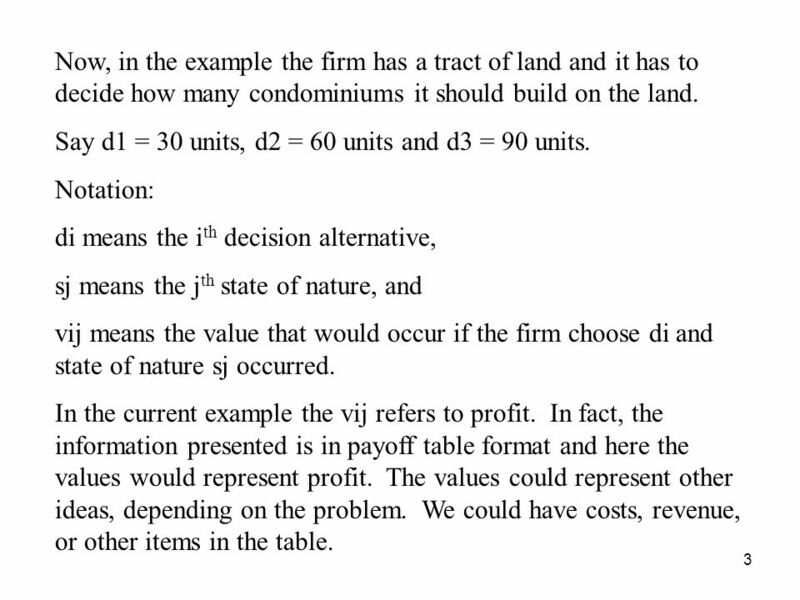 Notation: di means the i th decision alternative, sj means the j th state of nature, and vij means the value that would occur if the firm choose di and state of nature sj occurred. In the current example the vij refers to profit. In fact, the information presented is in payoff table format and here the values would represent profit. The values could represent other ideas, depending on the problem. We could have costs, revenue, or other items in the table. 5 5 Now, there are times when we might have some information about how likely the states of nature might be and sometimes we don’t have that information. For now, say we do not have this information. How do we decide what to do? One approach used to decide which alternative to choose is called the Optimistic Approach. 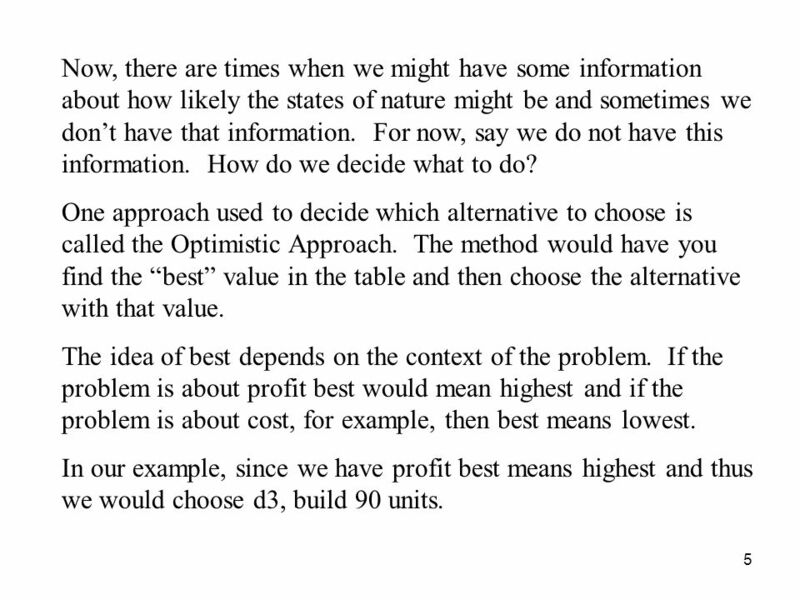 The method would have you find the “best” value in the table and then choose the alternative with that value. The idea of best depends on the context of the problem. If the problem is about profit best would mean highest and if the problem is about cost, for example, then best means lowest. In our example, since we have profit best means highest and thus we would choose d3, build 90 units. 6 6 I have reproduced our example here because I want to show you the optimistic approach in a little more sophisticated way. 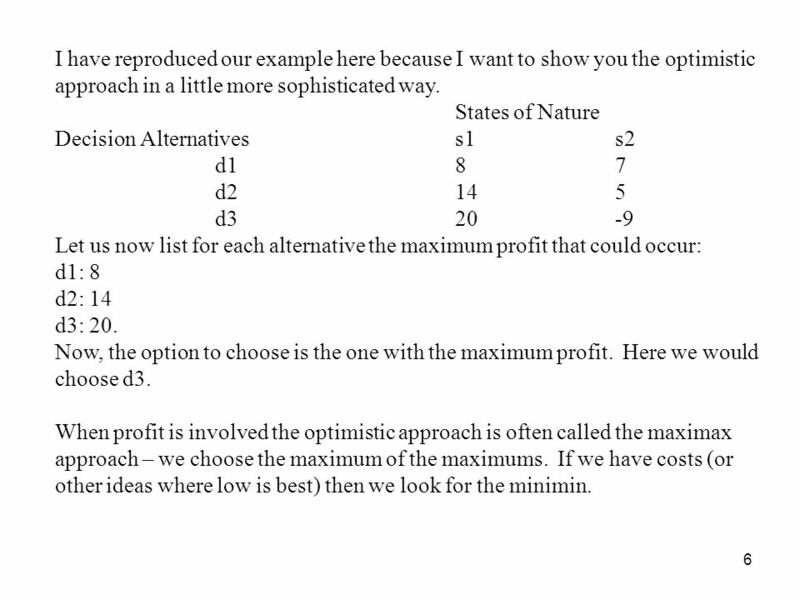 States of Nature Decision Alternatives s1s2 d187 d2145 d320-9 Let us now list for each alternative the maximum profit that could occur: d1: 8 d2: 14 d3: 20. Now, the option to choose is the one with the maximum profit. Here we would choose d3. When profit is involved the optimistic approach is often called the maximax approach – we choose the maximum of the maximums. If we have costs (or other ideas where low is best) then we look for the minimin. 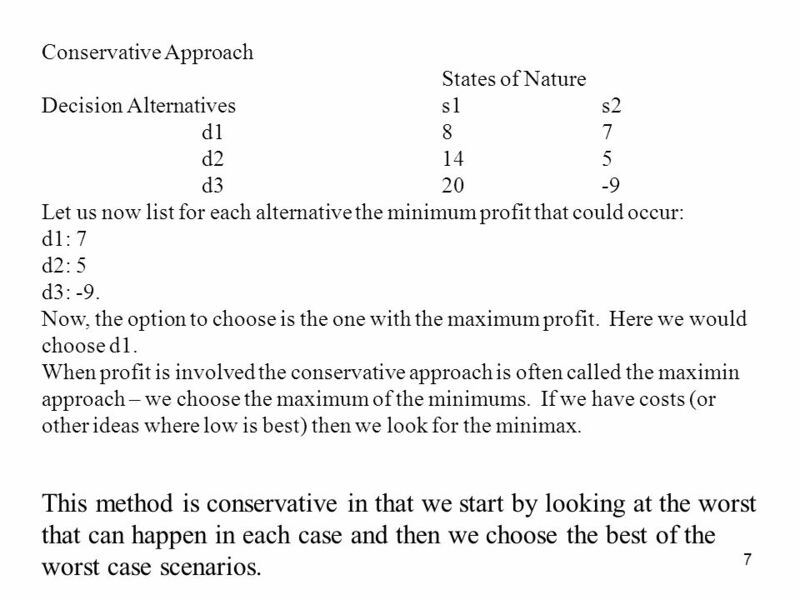 7 7 Conservative Approach States of Nature Decision Alternatives s1s2 d187 d2145 d320-9 Let us now list for each alternative the minimum profit that could occur: d1: 7 d2: 5 d3: -9. Now, the option to choose is the one with the maximum profit. Here we would choose d1. When profit is involved the conservative approach is often called the maximin approach – we choose the maximum of the minimums. If we have costs (or other ideas where low is best) then we look for the minimax. This method is conservative in that we start by looking at the worst that can happen in each case and then we choose the best of the worst case scenarios. 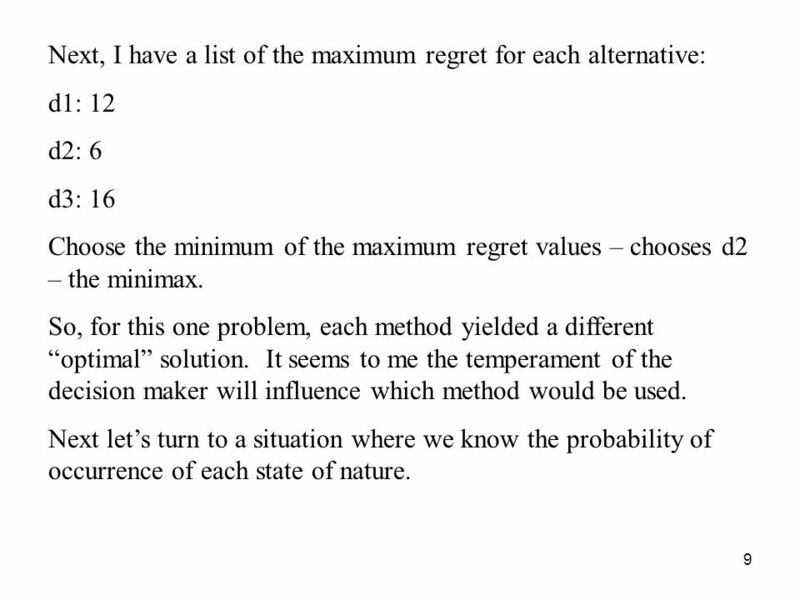 9 9 Next, I have a list of the maximum regret for each alternative: d1: 12 d2: 6 d3: 16 Choose the minimum of the maximum regret values – chooses d2 – the minimax. So, for this one problem, each method yielded a different “optimal” solution. It seems to me the temperament of the decision maker will influence which method would be used. Next let’s turn to a situation where we know the probability of occurrence of each state of nature. 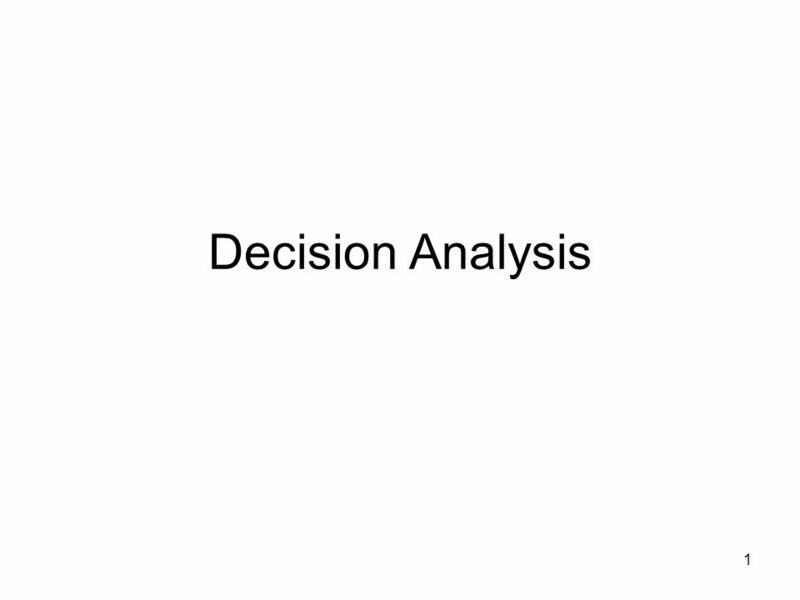 Download ppt "1 Decision Analysis. 2 I begin here with an example. In the table below you see that a firm has three alternatives that it can choose from, but it does." Module C1 Decision Models Uncertainty. What is a Decision Analysis Model? Decision Analysis Models is about making optimal decisions when the future is. 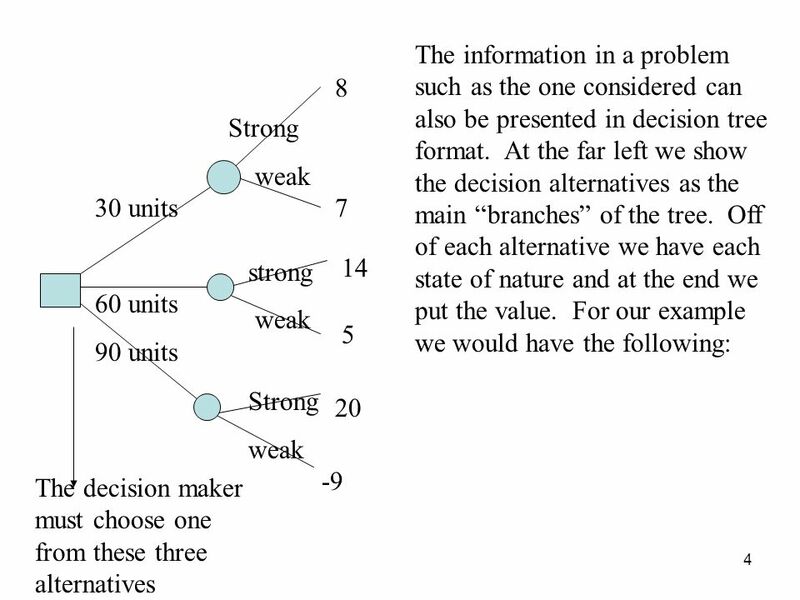 1 Decision Analysis with Sample Information. 2 I begin here with our familiar example. 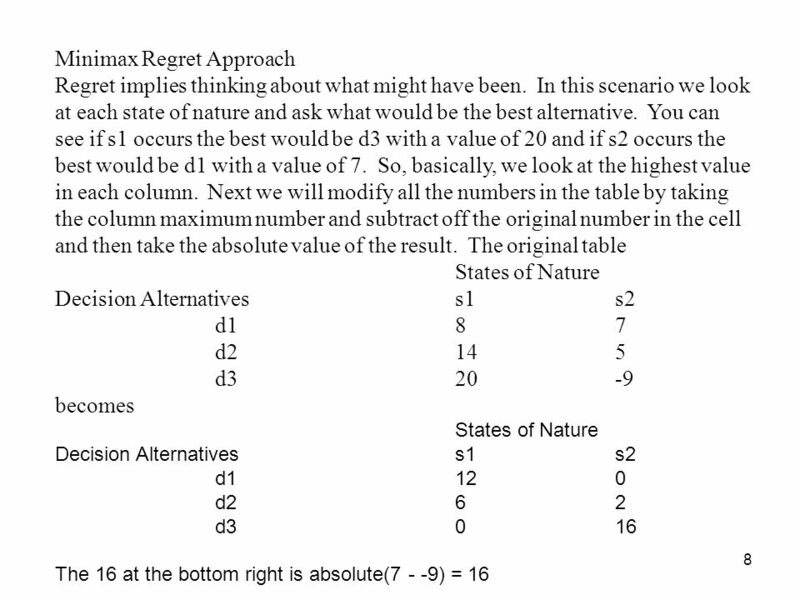 States of Nature Decision Alternatives s1s2 d187 d2145 d320-9 At. Lesson 9.1 Decision Theory with Unknown State Probabilities. 20- 1 Chapter Twenty McGraw-Hill/Irwin © 2005 The McGraw-Hill Companies, Inc., All Rights Reserved. 1 1 Slide © 2004 Thomson/South-Western Payoff Tables n The consequence resulting from a specific combination of a decision alternative and a state of nature. LECTURE TWELVE Decision-Making UNDER UNCERTAINITY. Ch 7 Decision theory Learning objectives: After completing this chapter, you should be able to: 1.Outline the characteristics of a decision theory approach. Copyright © 2002 by The McGraw-Hill Companies, Inc. All rights reserved. McGraw-Hill/Irwin Chapter Twenty An Introduction to Decision Making GOALS. Decision Analysis. What is Decision Analysis? The process of arriving at an optimal strategy given: –Multiple decision alternatives –Uncertain future. 1 Decision Analysis Decision-Making Under Uncertainty updated Systems Analysis Methods Dr. Jerrell T. Stracener, SAE Fellow NTU SY-521-N SMU EMIS. 1 1 Slide © 2000 South-Western College Publishing/ITP Slides Prepared by JOHN LOUCKS.